Despite of support and ready made design from Intel, PC makers are unable to created ultrabook to undercut prices of the Apple MacBook Air. 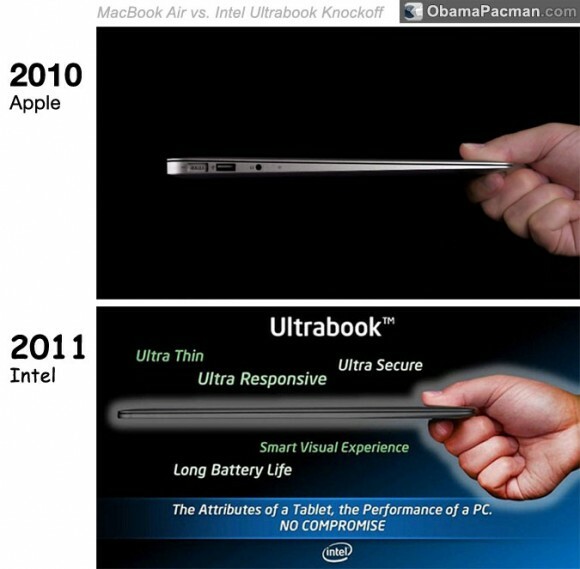 Intel is concerned about the post-PC era where iPad killed netbook segment, which primarily uses Intel Atom processors. Apple iPod, iPhone, iPad, and iPod touch use ARM processors from competitor of Intel. Apple is even making custom processor design such as A5 for iOS devices, although Apple is still using Intel processors in its computers. Ultrabooks will feature a similar design as MacBook Air and adopt li-polymer batteries, which will completely remove the device’s capability of exchanging the battery, to significantly reduce weight, while the machine will adopt metal chassis for heat dissipation and a solid state drive (SSD). The new MacBook Airs are priced at about US$999-1,599 with rather strong demand in the US; however, designing an ultrabook based on Intel’s technical suggestions will still be unable to reduce the machine’s price level to lower than the MacBook Air’s unless Intel is willing to reduce its prices. Main reason is that Apple’s high production volume, software efficiency, R&D, and innovations are already way ahead of PC makers. Thus it’ll cost more for PC makers to make the same product. So much for the Apple tax. 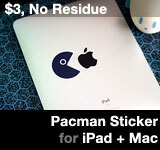 So in reality, when all the components are comparable to a Mac, a PC knockoff costs more. ObamaPacman would bet that the PC wannabes would lack Apple’s great laptop design, unibody aluminum construction strength, or pocketable power supply with patented Magsafe connector. 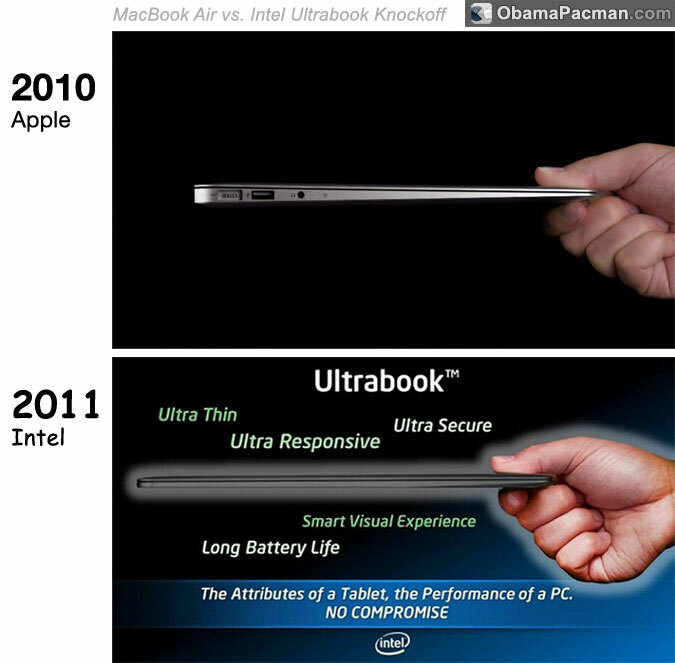 The 2011 Intel Ultrabook ad is basically a copy of Apple MacBook Air ad from 2010. “No compromise”? Ultrabook shows no ports, due to Intel’s photoshop artist messed up and cloned out all the ports. Describing “The Attributes of a Tablet” while showing a laptop rip-off adds to the epic fail. This entry was posted on Thursday, August 4th, 2011 at 9:30 am	and is filed under Mac, Microsoft. You can follow any responses to this entry through the RSS 2.0 feed. I hope they FAIL big time! Seems to be a repeat of the tablet wannabes. But the PC companies (such as ACER) that lost their netbook business might try this out and dig them deeper into the hole.